Accepting credit cards used to be expensive and complicated: You needed to set up a merchant account with a bank, you had to buy or lease a card reader, and you had to pay a setup fee, subscription fees, and fees on every sale you made. Today, a swarm of credit card processing apps for smartphones and tablets has rendered the process easier, cheaper, and highly mobile. PayAnywhere has developed a strong app for its mobile card reader. Most of these mobile payment processing services offer pay-as-you-go plans, in which you pay only a fixed percentage fee per transaction. Although these fees are typically higher than what you’d pay under a traditional arrangement, these newer services can provide any small business a simple, economical way to accept payments via credit card. And instead of making you invest in an expensive card reader, these services offer free readers that can fit in your pocket or bag. Just plug one into the audio jack on your smartphone or tablet and launch the accompanying app, and you’re ready to accept credit card payments for your goods or services. Most of these plans add value with features such an inventory system, where you can save prices and descriptions of the products you’re offering for sale. Several provide a full point-of-sale system, which enables you to attach cash drawers and receipt printers. We examined four mobile payment processing services, along with their respective card readers and software. Each supplies both an app for iOS devices (iPad, iPhone, and iPod Touch) and Android phones and tablets (although one provider's Android software is still in beta). Only one service currently supports BlackBerry devices. Accepting credit card payments can be a boon to your business, but the associated fees can be a drag on profitability. PayAnywhere’s pay-as-you-go fee of 2.69 percent per swipe is the least expensive of the four services we looked at, while Intuit's GoPayment and VeriFone's SAIL tie for second with fees of 2.7 percent per transaction. Square’s 2.75 percent fee is the highest of the four. If you’re processing more than $1300 in payments each month, you might be better served by one of the subscription plans that combine a monthly fee with a lower per-swipe rate: GoPayment costs $13 per month with a swipe fee of just 1.7 percent, and SAIL costs $10 per month with a swipe fee of 1.95 percent. Low transaction fees aren’t important if the software and service aren’t a good fit for your business. If you need to accept and track cash as well as credit card payments, for instance, GoPayment won’t work for you. 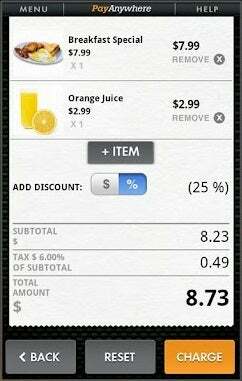 If you need to print paper receipts from iOS devices, you should consider PayAnywhere or Square. GoPayment is the best option for printing receipts from Android devices, and if you want the ability to charge cards via a Web interface in addition to using a mobile device. If you need a synchronized database for your inventory, or if you like the idea of scanning bar codes, SAIL is a good choice. Update: If your small business bills by the hour, you might be interested in reading about Intuit's new MoneyDue app, which turns calendar appointments into billable hours and provides the option to send E-bills through the Intuit PaymentNetwork. You can read all the details here. Note: This article was updated on 7/6/2012 to reflect the new features that some service providers are now offering.